Strength exercises for seniors are used to become and stay healthier, stronger, and more active. Furthermore, strength exercises increase muscle mass while raising metabolism. Also, strength exercises help with weight management and better sleep. 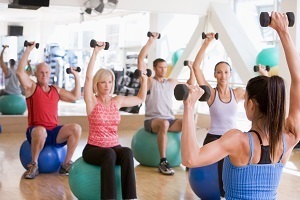 And, strength exercises reduce symptoms of osteoarthritis, diabetes, osteoporosis, back pain, and depression. Finally, strength exercises for seniors are doable around the house. In addition, general information about exercises for seniors is available elsewhere. Also, other types of exercises, such as balance exercises, flexibility exercises and, aerobic exercises, are available to seniors. Most of all, always include a 5 to 10 minute warm up before you starting strength exercises for seniors. Doing light exercises such as walking in place and arm circles, gets your muscles and joints warm before doing strength exercises. Lying Hip Bridges, one of the strength exercises for seniors, work the glutes, your body's largest muscle group. First of all, lie flat on your back with your knees bent and feet flat on the floor. Next, flatten your lower back against the floor, squeeze your bum and push your hips up into the air. Also, make sure to push through your entire foot, almost as if you're trying to push your toes out the end of your shoes. Finally, pause, then slowly lower to start. Squats to Chair, another of the strength exercises for seniors, strengthen the entire lower body and core. First of all, stand with your feet hip-width apart directly in front of a chair. Next, keeping your chest upright, push your hips back and bend your knees to lower your body toward the chair. And, either touch your bum to the chair or sit down on it. Also, at the bottom of the squat, your upper body should be leaning forward only slightly. Finally, pause, then push through your feet and squeeze your bum to return to start. Side Lying Circles, another of the strength exercises for seniors, strengthens your hips while improving mobility through the joint. First of all, lie on one side on the floor with your body in a straight line, your bottom arm extended straight past your head. Next, rest your head on your bottom arm and squeeze your abdominals to pull in your belly. Also, keeping your hips directly over each other, lift your top leg to about hip height and move your leg in small clockwise circles in the air. And, pause, then perform the circles in counter-clockwise motion. Finally, lower your leg to return to start, and repeat on the opposite side. Also, note that the visual shows only generally how the routine works. Quadruped Opposite Arm and Leg Balance, another of the strength exercises for seniors, improves balance, coordination and strength in the back and abdominals. First of all, get on all fours with your hands directly under your shoulders and knees under your hips. Next, keeping your back flat and abdominals tight, lift one hand to reach straight in front of your shoulder while lifting your opposite foot straight behind your hip. Now, hold for three breaths (or as long as you can maintain balance), and then lower your hand and foot toward the floor to return to start. Finally, repeat on the opposite side. Dead bugs, another of the strength exercises for seniors, improves core stability for greater balance and strength. First of all, lie flat on your back with your arms and legs up in the air, your knees bent. Next, maintaining contact between your lower back and the floor, lower one leg until your heel just about touches the floor while also lowering the opposite arm toward the floor above your head. Finally, lift them back up to return to start, and repeat on the opposite side. Also, you can make this exercise harder by keeping your legs straight rather than bent. Side Planks, another of the strength exercises for seniors, improves side-to-side core stability as well as strengthens your shoulders. First of all, start by lying on your side, propped up with your elbow directly below your shoulder. Next, with either the sides of your feet or the sides of your knees stacked on the floor (do what's comfortable for you), squeeze your core and lift your hips off of the floor so that your body forms a straight line from your ears to either your feet or knees. Now, hold for as long as you can while maintaining good form. Finally, lower your hips to return to start, and repeat on the opposite side. Wall Angels, another of the strength exercises for seniors, improves posture and back pain. First of all, stand with your back flat against a wall and your feet about 3 to 6 inches from the wall. Next, with the back of your head touching the wall and your arms straight out along the wall and bent upwards at the elbows, tuck your chin to your chest. Now, turn your palms out and slowly raise your arms, maintaining contact with the floor or wall. Then, raise your arms as high as you can. Finally, pause, then lower your arms to return to start. Abdominal Contractions, another of the strength exercises for seniors, increases strength in the abdominal muscles. First of all, take a deep breath and tighten your abdominal muscles. Next, hold for 3 breaths and then release the contraction. Wall pushups, another of the strength exercises for seniors, increases strength in the chest and shoulders. First of all, stand an arm's length in front of a wall that doesn't have any paintings, decorations, windows or doors. Next, lean forward slightly and put your palms flat on the wall at the height and width of your shoulders. Now, keep your feet planted as you slowly bring your body towards the wall. Then, gently push yourself back so that your arms are straight. Finally, do twenty of these. Pelvic Tilts, one of the strength exercises for seniors, strengthens and stretches muscles in the lower back. First of all, take a deep breath, tighten your buttocks, and tilt your hips slightly forward. Next, hold for a 3-count. Finally, repeat 8 to 12 times. Shoulder Blade Squeeze, one of the strength exercises for seniors, strengthens postural muscles and stretches the chest. First of all, sit up straight in your seat, rest your hands in your lap, and squeeze your shoulder blades toward one another. Next, focus on keeping your shoulders down, not hunched up toward your ears, and hold for 3 seconds. Finally, release and repeat 8 to 12 times. Toe taps, one of the strength exercises for seniors, strengthens the lower legs. Heal raises, one of the strength exercises for seniors, strengthens the upper calves. First of all, sitting in a chair, keep your toes and the balls of your feet on the floor and lift your heels. Knee lifts, one of the strength muscles for seniors, strengthens thighs. First of all, sitting in a chair, with your arms resting but not pressing on the armrests, contract your right quadriceps muscles and lift your leg. Furthermore, your knee and the back of your thigh should be 2 or 3 inches off the seat. Next, pause for 3 seconds and slowly lower your leg. Finally, complete 8 to 12 repetitions and then repeat with the opposite leg. Shoulder and Upper Back Stretch, one of the strength exercises for seniors, stretches the shoulders and back. First of all, bend your right arm, raising it so your elbow is chest level and your right fist is near your left shoulder. Next, place your left hand on your right elbow and gently pull your right arm across your chest. Now, hold for 20 to 30 seconds. Finally, repeat with the opposite arm. Ankle rotations, one of the strength exercises for seniors, strengthens the calves. First of all, seated in a chair, lift your right foot off the floor and slowly rotate your foot 5 times to the right and then 5 times to the left. Next, repeat with the left foot. This is part 1 of Pilates for Beginners. Furthermore, pilate exercises are great for strengthening the whole body including the abs, legs, arms, thighs, and pretty much everything else. Also, this Pilates workout should be done 2 times a week, but obviously you can improvise and do it whenever you see fit depending on you workout program. And, pilates exercises are particularly known for strengthening the abs and core, but it is also great for strengthening the entire body and Pilates cardio as well. The strength exercises for seniors described here, will make you stronger. And remember to follow the recommendations referenced earlier.